Click here for a TJC Leadership Profile on Chester Cooper, Director of the Department of Community Corrections and Rehabilitation in Hennepin County, MN. 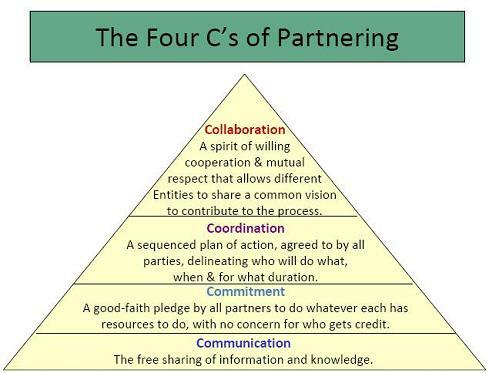 All four C’s of partnering are important for the success of the TJC model, but collaboration must occur for the model’s long-term success. To see if you are ready to be part of a collaborative effort. You should be able to answer “Yes” to each statement below. Are you ready for a collaborative effort? I recognize that the agency I represent is mutually dependent on other agencies for the success of people leaving jails. I and the agency I represent are willing to give up some authority/control for the TJC model to succeed. I know that I will benefit and gain new knowledge when working together with outside agencies. I understand that not everyone shares my perspective and I’m open to different views. I am willing to commit my time and effort to making the TJC model work. I am committed to suspending my judgment about what works to change offender behavior and will consider new information as I begin to collaborate with other system stakeholders. The outcome of a collaborative partnership is something new that harnesses the knowledge of multiple agencies to create a new model of reentry with an investment in shared authority, resources, and priorities for the common good. 1 W. A. Kraus, Collaboration in Organizations: Alternatives to Hierarchy (New York: Human Sciences Press, 1980), p. 12. 2 North Carolina’s Serious and Violent Offender Reentry Initiative: Going Home. A Systemic Approach to Offender Reintegration. Accessed 12/8/2009 at http://steveapplegate.com/northcarolinatasc/re%20entry%20NASADAD.ppt. 3 D. Robinson, T. Hewitt, and J. Harriss, Managing Development: Understanding Inter-organizational Relationships (London: Sage for the Open University, 1999), 7. 4 Kraus, Collaboration in Organizations, 12.